Inshore fishing is perfect for families, sea-sick conscious anglers and targeting the most popular saltwater inshore species. 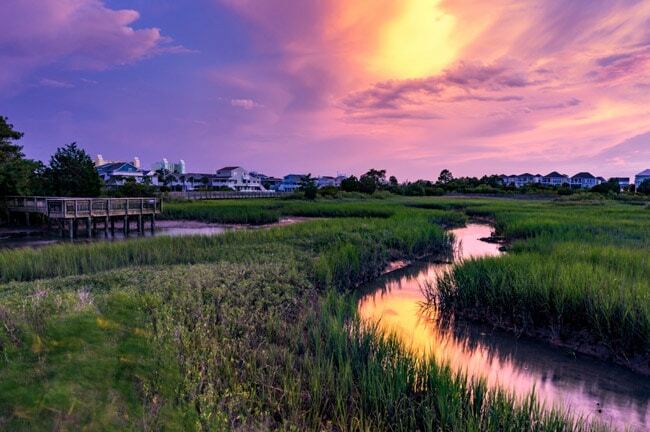 Myrtle Beach inshore fishing means traveling to the creeks, estuaries and backwaters that are prominent in the North Myrtle Beach, Cherry Grove Beach area. Targeted species include: Flounder, Redfish, Black Drum, Sea Trout and small Rays. Inshore fishing is often where we’ll have the best luck catching a high quantity of excellent table fare — if you’re looking to catch your dinner for the night, we’ll take you to our favorite Flounder spots where we can reel in doormats big enough to feed even large families! To begin our trip, we’ll start at our marina and travel into the Intracoastal Waterway winding our way into Cherry Grove or into the creeks before the Little River Jetties. The water will be very calm and flat and generally the number of other boats targeting the same areas will be small. This charter is perfect for those who may be new to saltwater fishing and don’t wish to head into choppier waters. We’d welcome you on a Myrtle Beach inshore fishing charter with us! We’ve been running charters in the Cherry Grove/North Myrtle Beach waters for years and would love to welcome you aboard one of our boats.